I want to give a big and hearty CONGRATULATIONS to Holly, the winner of the Rock 'N Learn Educational CD or DVD of Choice! Holly now has 48 hours to confirm! I also want to give a big and hearty CONGRATULATIONS to Michael, the winner of the BOX4BLOX Original LEGO Storage Organizer! Michael now has 48 hours to confirm! I also want to give a big and hearty CONGRATULATIONS to Allen, the winner of the journey gym - The World's First Portable Gym! Allen now has 48 hours to confirm! 2 Responses to *** WINNERS *** Holly, Michael and Allen are Living the Life of Riley! CONGRATULATIONS! 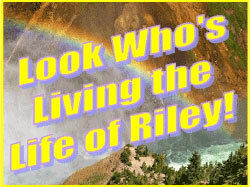 *** WINNERS *** Geoff, Amanda and Les are Living the Life of Riley! CONGRATULATIONS!